Easter is fast approaching and here I am again thinking what I can make for our Easter Sunday celebration at home. Besides for making dinner, I am thinking of making my own delicious Easter eggs. Not so sweet and from the leftover food that I have in my kitchen cupboard. 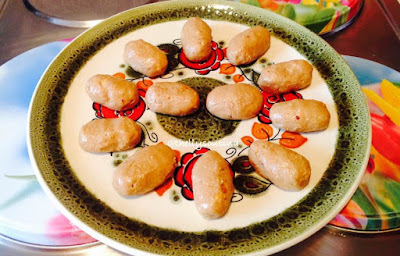 It´s an easy no bake Easter eggs recipe from scratch. I still have a lot of leftovers from baking and from my breakfast oats that I used to eat whenever I am craving for it. I still have leftover peanut butter from making my Valentine´s Day Heart Dessert recipe last month, some oats and some chocolates for baking. 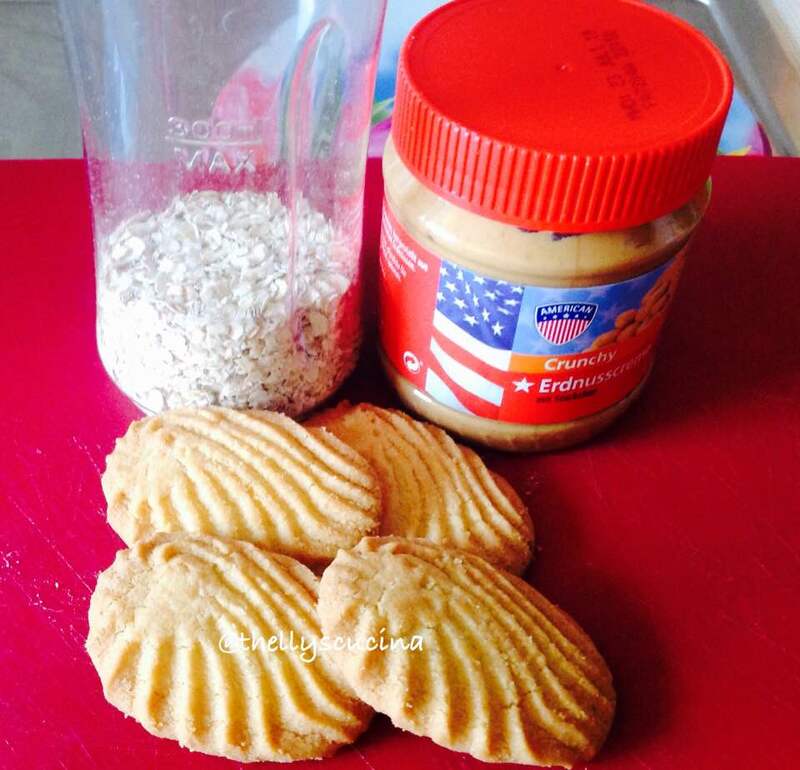 The ingredients: Oats, peanut butter and cookies. 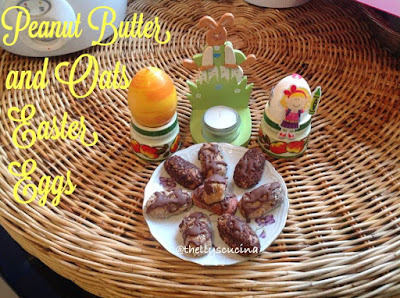 So, let´s start with this no-bake peanut butter and oats Easter eggs. It is still time until Easter Sunday. I know, I have to make these Easter eggs again as what I have made today will be consumed by tomorrow. Oats, cookies and peanut butter. 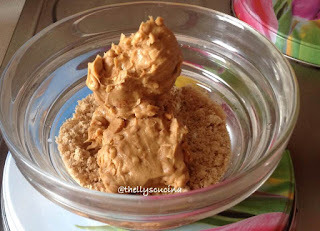 Cold from the fridge: oats, cookies and peanut butter. Put the instant oats and cookies in the food processor and process them until fine. Then put the processed oats and cookies in a bowl and add the peanut butter. Mix them by using your hands. Put the mixture in the fridge to set in for about 15 minutes. 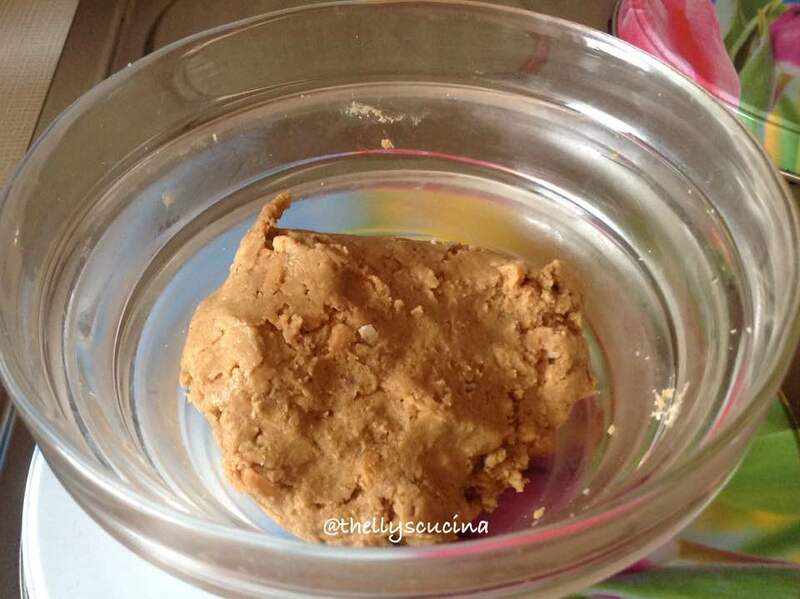 Spread a bit of cooking oil in your inner hands before forming the peanut butter mixture into an egg form. 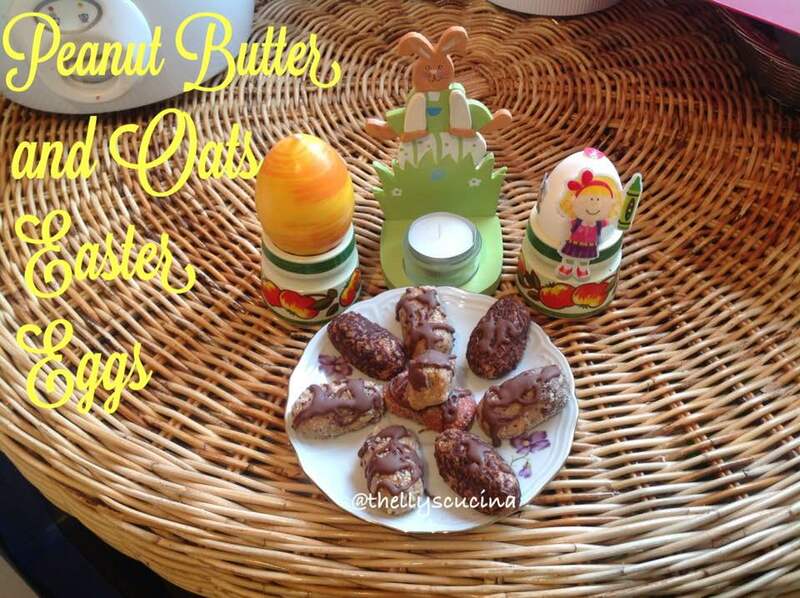 Roll the peanut butter and oats Easter eggs to the grated hazelnuts. 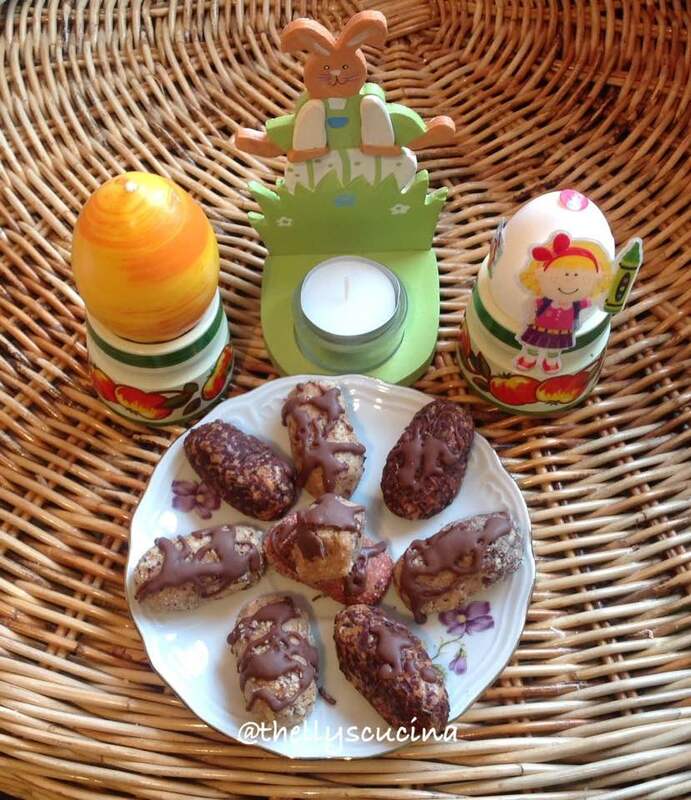 Rolled Peanut Butter and Oats Easter Eggs. You can use any cookies you want. You can even use Grahams crackers for this recipe. You can make your own chocolate glaze by melting chocolate melts for decorating. You can cover all the eggs with chocolate and sprinkles you may still have as leftovers. 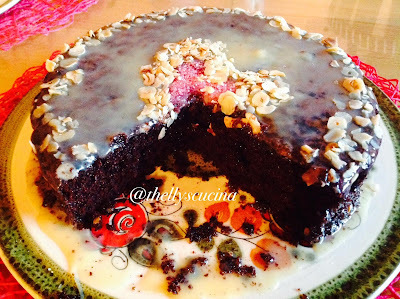 I used grated hazelnuts because I still have hazelnuts leftover from my hazelnut cake. I could have used desiccated coconut if I still have in my cupboard. You can, of course, decorate the eggs with different kinds of sprinkles that fit Easter season. 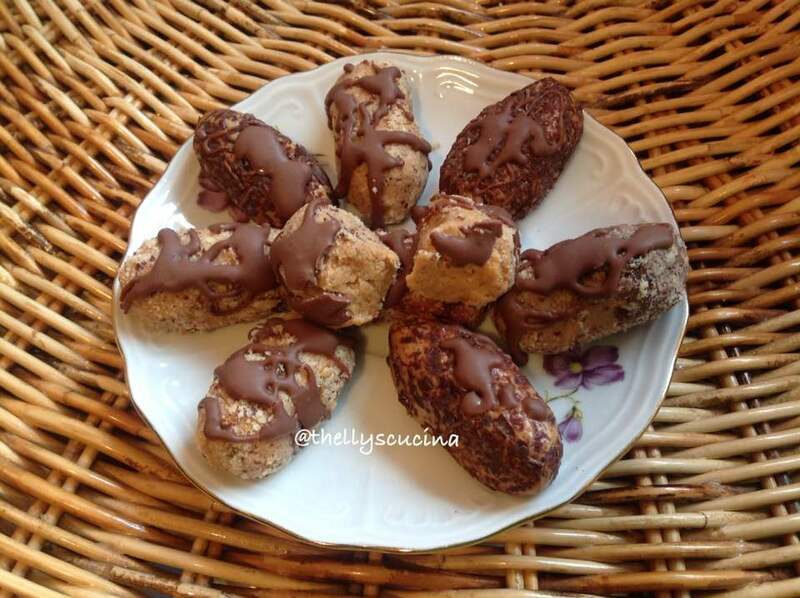 No Bake Peanut Butter and Oats Easter Eggs. By the way, how do you celebrate Easter season? Here is how the Germans celebrate Easter. Feel free to check my blog and I would be happy if you will stop by and drop a comment. Thanks for reading my blog. Please feel free to comment, like and share this to your social media sites. Have a great day! Ciao! We celebrate Easter by having an egg hunt for our kids, who are entirely too old for such a thing. But they love it. This is a wonderful recipe! We celebrate like that too here in Germany but since our son is no longer a small kid, he doesn´t want to do Easter hunting anymore;-) Thank you for your nice comment Amy Reade.